Fred Nazem is an entrepreneur, a philanthropist, one of the earliest venture capitalists, and a corporate architect who has founded, operated or financed several multi-billion dollar corporations. 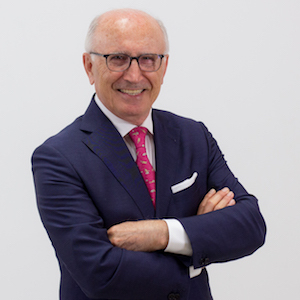 He has been building highly disruptive, industry-leading healthcare and technology companies since the early 1970’s when he established several private venture capital partnerships, including Nazem & Company. As the Founder and Managing Partner of Nazem & Company, Mr. Nazem either started, financed or guided over two hundred companies in the information technology, telecommunications, healthcare and digital media sectors. Many of these companies have become leaders in their industries, some 60 of them went public, and more than two-dozen have grown into multibillion dollar enterprises. Mr. Nazem’s career has been marked by a strong affinity for the digitization of healthcare services. Among his many contributions to the healthcare field, he is credited for having co-led a group of 12 investor-entrepreneurs who enabled the formation and commercialization of MRI technology. He founded Cirrus Logic (OTC:CRUS), a leading semiconductor company, Blue Bird Bio (OTC:BLUE), a gene therapy company and Genesis Health Ventures, (NYSE:GHV), a leading eldercare company. He also backed companies like Universal Health System (NYSE:UHS), a leading forprofit hospital system, and Oxford Health Plans, (OTC: OXHP), a company he initially financed as a VC, then later stepped in as Chairman, leading a successful turnaround when Oxford experienced operational and financial difficulties in the late 1990’s. For the past decade, Mr. Nazem has been a passionate advocate for the digital delivery of highly personalized regenerative medicine in a consumer-centric environment. He is currently the CEO of Rejuvenan Global Health, an early stage epigenetics company focused on commercializing the revolutionary findings of the 2009 Nobel Prize in Telomere biology. Mr. Nazem currently serves on a limited number of boards, including Columbia Presbyterian Hospital’s Science and Technology Advisory Board, the Chinese American Medical Association, and the GenapSys Corporation, a cutting-edge gene sequencing enterprise. A scientist turned financier, Mr. Nazem holds a B.S. degree in biochemistry from Ohio State University, an M.S. degree in physical chemistry from the University of Cincinnati, an M.B.A in finance from Columbia University, and has done doctoral work in quantum physics at Washington University. Among many honors, he is the recipient of the Fulbright One to World award and the Ellis Island Medal of Honor for his contributions to the American economy.